It’s all in the title this week folks, no real need to read any further. The dog hates me, what else do you need to know? It’s disappointing though, mightily disappointing. You see I rather fancy myself as a dog-person. If you’ve seen some of my earlier blog posts like this and this, you’ll know this already. You’ll know that I think I’m actually ‘part dog’ myself. Plus, I like dogs, I’m not afraid of them and I tend to get on really well from them right from the off. I like to make an effort and becomes friends with them and, like The French, they generally appreciate that. Not this mutt though. Not him. He’s a little furry runt, this neighbour’s dog, not at all intimidating, and I would quite like us to be mates. I been trying but I think I’ve given up hope now. I think this little post is the final nail in the coffin of our relationship. He’s usually holed up inside his master’s house, this little tyke, and then he’s obviously not a problem. It’s when they let him out in the garden that all hell breaks loose. He’s just a bit overly-territorial, I guess. 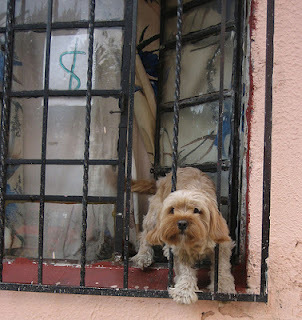 He stands in behind the railings of his steel gate and he peers out the gap and when someone passes, he barks at them. Fair enough, you might well say, he’s a dog. … and he doesn’t bark. I get right up beside him and he’s watching me intently and I walk past him and he seems fine with that and then, only then, when I’m gone past him, does he bark. And, no, he doesn’t just bark, he goes friggin’ Ballistic. He hurls himself at the gate, as if trying to tear it apart with his tiny jaws, he bawls abuse in his little doggy voice. You would get the impression he would tear my throat out, if he could only get through the gate and if he could only reach up. Once he’s started, he doesn’t stop barking. Ever. The shop which I go to is over five minute further past his gate and, all the time until I get there, I can hear him barking, barking, barking. When I come out of the shop again, milk in hand, I can hear that he’s stopped and he doesn’t start again until I do the same thing again; walk past his gate, get eyed up intimidatingly and then barked all the way home. “Why don’t you stop at the gate and make friends with him?” I hear you ask. (I do, I’m like that) To this I say, “Do you really think I haven’t tried that, I mean, do you really?” Trying to make friends with him is the very worst thing you can do. Believe me, I know. Friendship-attempts raise the level of apoplexy in the mutt to literally terrifying levels. Not the sort of terror that applies to my own personal safety, I’m not that big a wuss. No. It’s that terror that this dog will drop dead at any moment from the sheer force of his hostility. So I can’t win. I suppose I could go around to the shop in the other direction but it’s a long way to go just to keep a tiny dog alive. Hate me if you must but it’s a price I find myself unwilling to pay. … maybe I will walk around the long way after all. The only thing I can recall even vaguely similar to this was a flat I once went to to deliver something—no idea what flat or why exactly I was there—but I knocked on the door—nothing—knocked again—nothing—went to walk away and this creature from hell threw itself at the door and went berserk. Sometime later I had reason to go back to the flat—again, no idea why but I do know that this time I was not alone—and the same thing happened, exactly the same thing. Most peculiar. I’m not a dog person but that doesn’t stop me stopping to talk to dogs often ignoring their owners completely. But I’m wary of them. I always let them sniff my hand before attempting any kind of physical contact. In the past I’ve approached with my hand raised to pet them and a few didn’t like that and snapped at me but since I’ve done the hand thing that’s never happened. Cats though are something else. They’ll stroll up to me, mewl in that moany way only a cat can, and I’ll start a conversation with them along the lines of, “Yes, I know, it’s terrible. (mewl) Awful, yes. It is. (mewl) I think so too. Yes. I agree completely. (mewl) Uh huh. I would too.” And so on and so forth. You get the idea. I do much the same with the bird. But a barking dog is another thing completely even in the tail is going and it’s obvious he’s as happy as Larry to see you. This dog looks a bit like our dog, though our dog would not behave like his, at least I hope not, but I understand your sentiments. Dogs bring out the best and worst of us, and I expect we do likewise. I have a problem this very night teaching our dog not to pee in places where he's not supposed to pee. I tell him in my most calm and reasonable voice but he will not learn. And as much as I'm supposed to love him and in some ways I do, I cannot contain my rage, my anger at his unreasonable approach to toileting. Maybe we both should take the long way round. I'm afraid to say that dog sounds like a bit of a knob. I love dogs, but I am actually a mad cat lady, and will generally befriend every cat I meet.. apart from the cat from two doors over. This cat is a nasty aggressive little guy.. who keeps breaking in to MY HOUSE then growling and hissing at me till I sweep him out with a broom. Have you tried telling the dog to "Stop barking!" Sometimes that works. What if your interpretation is off? Suppose the little guy took a look at you one day, decided you were a nice, friendly soul and the ONE person he could turn to. So he begins to bark, "Hi Ken!" This is quickly followed by a plea to let him out so he can walk to the store too. Stretch his little doggie legs, sniff a few new things, leave a calling card behind. Thus, when you ignore him, he begins cursing at you in Dog. The further you walk away, the angrier he gets. And all the more vocal. Then you get angry because he's spoiling your nice walk. Anger all around just because all he wanted was to get out and walk with a nice guy like you. Perhaps we're a bit territorial ourselves, you and I. I completely understand the anger. We've had a couple of neighbors over the years who weren't the best dog owners, and would let their dogs just run around the neighborhood. The dogs that run into my own yard and bark at me... well. We don't get along so well. Elisabeth: The dog in the picture doesn't actually look like the dog down the road, I just liked the picture in this context. :) Keep at the toileting thing, scold when it doesn't work and praise embarrassingly-well on those rare times when he does good and those rare times will become less-and-less rare. I know... I was that soldier. Maw: Hah. :) In seriousness, I think most dogs are a reflection of their owners and how they treat and train them... but, yeah, there's the odd plain-old knob too, I guess. My friend had a dog that was quite the opposite. She was a functioning human tongue away from giving him lessons on life, but she always gave him the sort of looks that let him know what he should or shouldn't do. Sometimes it was just eyeing up a sandwich so that she could eat it, but she always did the trick. Even when he came in drunk, she wouldn't make a fuss. Just look at him, say hello, and go back to bed. She was just that sort of dog. His new dog, on the other hand, barks at him when he comes home from the pub. Yes, you read that right: his own dog barks at him. And not in the disapproving way of his previous dog when she knew he had been up to less good than usual (negaitve good, in fact, since he's usually up to no good). Nope, this new dog barks at him just for being there. I'm not much of a dog person - I think it had to do with hygiene more than anything else, having become a bit of a freak when it comes to my hands in recent years - but I know a good dog when I see a good dog. And your neighbour's dog... well, it would be lucky to get a kick in the face. Or a more legal treatment. You know, one that doesn't qualify as abuse to animals. I have a feeling you're missing something here, Ken. Might it not be the case that dog senses your cosmic all-conquering alpha-male presence and only barks when he feels you're at a safe distance? In all due fairness, the dog does not know any better, so there is no reason to blame the dog. Its the owner that should bear the blame. It is a matter of training the dog.